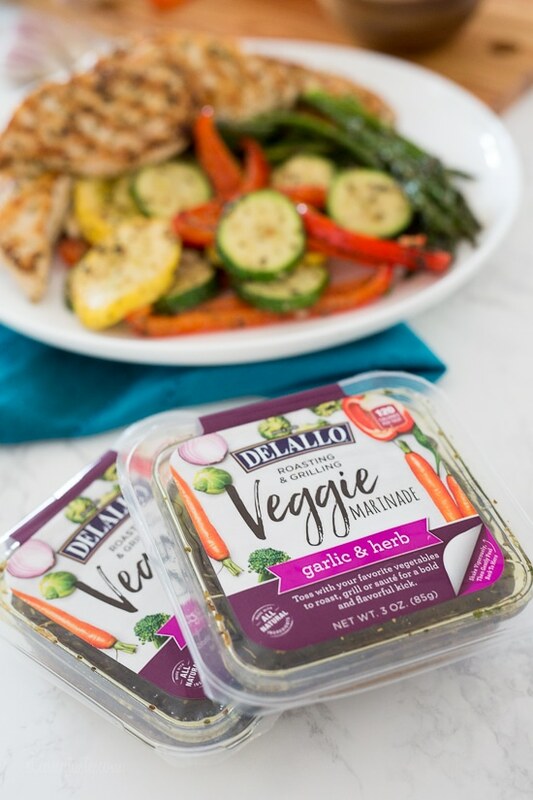 When Delallo sent me their new Veggie Marinades to try out, I knew they would be great because I love everything Delallo makes (best jarred Pomodoro sauce out there!). I’ve been putting their marinades on everything, they are so good! So I partnered with them to create this recipe using their marinade and I loved how easy this dish turned out. 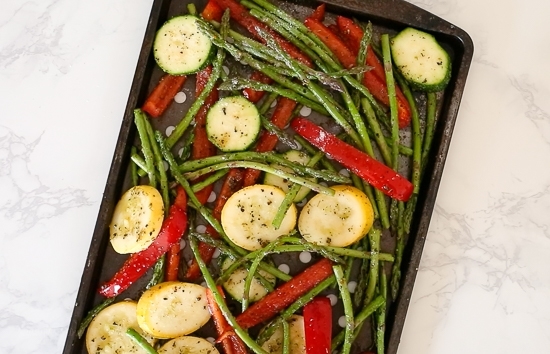 In the cooler months, you can of course make this on a sheet pan, but it’s still summer and I plan on using my grill as long as I can! 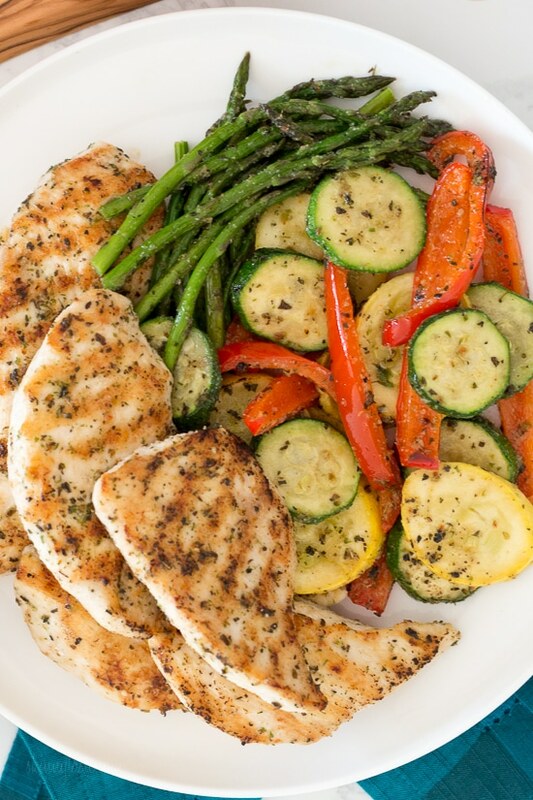 This is so easy to make, simply marinate the chicken and veggies at least 1 hour (or overnight for best results!) then throw it on the grill and dinner is ready in less than 20 minutes. 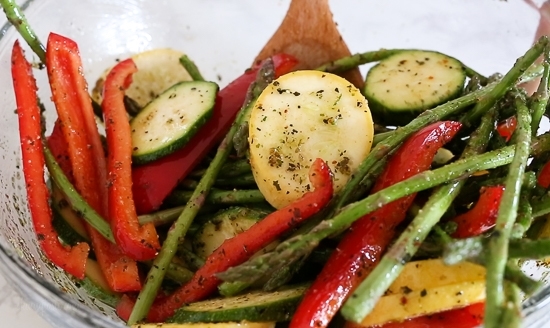 Put veggies on 1 large grill tray or 2 smaller trays (or cook in batches), season with 3/4 teaspoon salt and black pepper and cook, turning constantly until the edges are browned, about 8 minutes. Set aside on a platter. Cook the chicken about 4 to 5 minutes on each side, until grill marks appear and the chicken is cooked though, transfer to a platter with the veggies and serve. This was DELICIOUS and so easy!!!! The grocery store near me carries some Delallo products. However, not the veggie marinade. They have a garlic & Herb chicken marinade. Would this work just the same? My favorite herbs are garlic, ginger, parsley and basil. I love using herbs on salmon or chicken. This recipe looks so good and easy. I want to try it today! 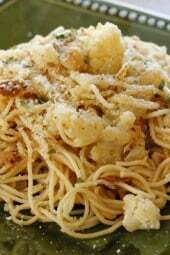 This recipe was soooo good!. They don’t sell the marinade in my area, but I substituted a lemon and garlic marinade from my local grocer and it was fantastic! Thank you for providing a low calorie delicious meal! Are thhe points mentioned correct for weight watchers freestyle the new plan? How did you gather the 6 Smart Points for this meal? Is it due to the marinade? Wondering if you are going to update the smartpoints values of your recipes now that Weight Watchers has enhanced the plan to Freestyle. Yes, most of them are already updated. sorry, to clarify, 1 point was for the Simply Filling plan. I don’t understand why such a small portion of chicken ( 3oz???) and veggies is 9 points?? is that correct?? Is that marinade loaded with oil? 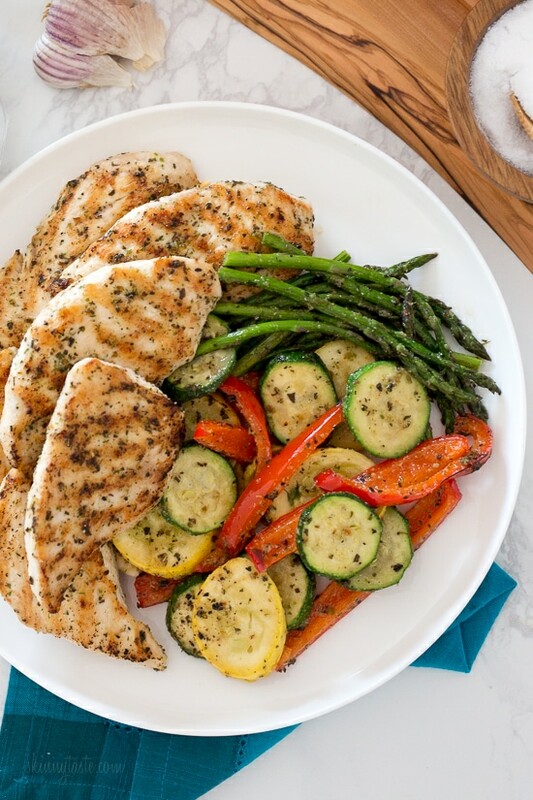 This sounds so yummy and healthy, but 3oz of chicken would never fill me and I wouldn’t want to eat 2 portions for 18 points!! Can you clarify this at all? I love your recipes, but the portions often seem small. Could you roast this in the oven? 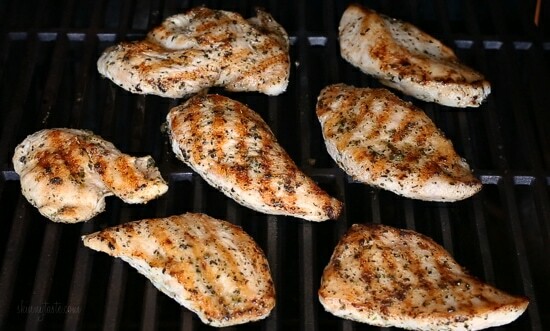 Going to make grilled chicken with herbs this evening! Thank you for the inspiration! Hi Gina! I love your recipes and meal plan using 90% of Skinnytaste recipes. I want to try this, but the Delallo marinade is not available in my area of Canada – are you able to recommend a substitute or a quick fix that I could make at home? Thanks! Thanks for the sub! I’ve been looking for Delallo marinade at all my local grocery stores with no luck. Thanks for the alternative . I cannot find the delallo marinade anywhere. I’m confused here- this serving is worth 9 Smart Points which means 7 of the points are from the marinade since 3 oz chicken is only 2 points? 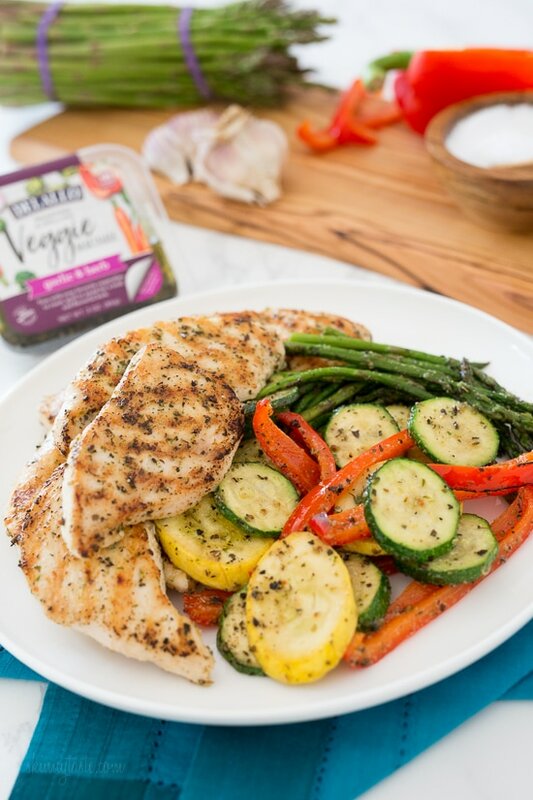 I only get 30 pts a day so 7 of them in a marinade for chicken & veggies seems excessive… It really does sound good though, wonder if the points are not accurate or if you could use less marinade or recreate it. I put in her totals at the bottom into the calculator on WW app and it was coming to 6 so per serving. With freestyle, majority of ingredients are 0SP. The marinade would be the only thing with points. The serving of this recipe says serves 6, and the marinade says serves 6. So I got 3SP a serving. 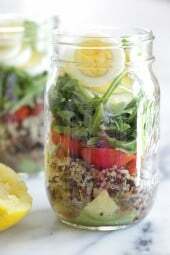 I would love to check the ingredients, but they are not listed? The ingredients on the Delallo marinade says it has cane sugar in it! 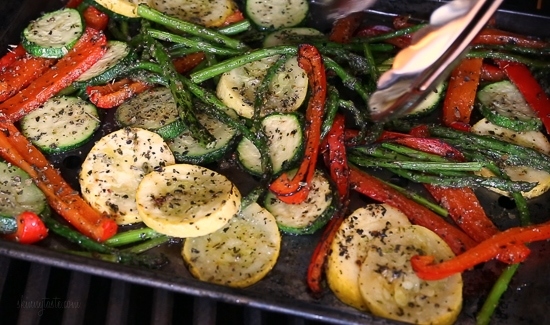 SOunds great and would like to try it but could you do this in the oven …….grilling is not an option. Really wish more recipes included baking alternatives …….not everyone can grill!!! THanks! Perfect! Just what I was looking for! Oven temps! How long would you recommend cooking this in the oven for if we don’t have a grill? I would imagine that should one not want to purchase this specific marinade, the dish would turn out just as well with another brand or something homemade? I realize that sites such as this depend on paid product advertising for their existence, but frankly don’t like feeling that I must buy the product to enjoy the recipe. Of course, use whatever brand you prefer or have on hand. Gina, I live in New Jersey and went to buy the Delallo at Shoprite but they didn’t have it. Where can it be found? 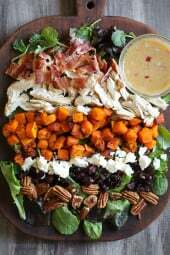 This looks fantastic, but Delallo Foods products are impossible to find in Columbus Ohio. I wish they would expand their distribution. Giant Eagle has a nice amount of them, usually in their own little section! I’m going to try this with skinless, boneless thighs, which should be awesome. Thanks for the inspiration! Hey Heather, where can I find the marinade in Ottawa? This looks wonderful! Can you give me some tips on how to make it without a grill? A grill pan or in the oven! Great recipe! I’m thinking of pounding the chicken before cooking it. Hope it won’t become too dry! I have never ever seen Delallo products where I live. I’ve looked at local stores, savemart, Safeway, etc. I wish I had access to them locally and to avoid shipping costs. SOunds great and would like to try it but could you give directions for baking in oven…….grilling is not an option. I really wish more receipts had these directions. Thanks!!!! !